For June 29, 2015, here's a look at why the stock market is down today a whopping 350 points – the biggest fall since June 2013. 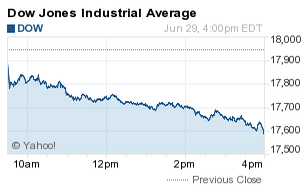 The DJIA today cratered 350 points as traders sold on fears that Greece may default on its debts. The nation shocked European Union ministers over the weekend by announcing no intentions to pay debts due on Tuesday and plans to allow its citizens to vote on a referendum over whether the country should accept the EU's debt conditions. Banks across Greece will be closed for the week and the nation's central bank has imposed capital controls to prevent runs. Shares of National Bank of Greece (NYSE ADR: NBG) fell more than 24% on the day. Today, all three major U.S. indexes fell more than 1% for the first time since May 26. The S&P 500 slumped more than 2%, while the Nasdaq fell 2.4%. Monday's decline pulls the Dow Jones into negative territory for the year. The S&P 500 Volatility Index (VIX), the market's fear gauge, jumped nearly 35% today. Greece, China, and Puerto Rico: The Dow Jones fell as the Greek debt talkscollapsed again over the weekend, and investors were further spooked by falling Chinese stocks and an announcement by politicians in Puerto Rico that the U.S. territory will be unable to pay off its debts to creditors. Standard & Poor's announced the agency has downgraded Greek debt to a rating of "CCC-." The ratings agency also raised the probability that Greece could exit the Eurozone to roughly 50%. Financial Fallout: The financial sector took a big hit today, falling nearly 2% and weighing down the broader S&P 500. Domestic banks currently are exposed to roughly $12.7 billion of Greek debt. Shares of Wells Fargo & Co. (NYSE: WFC) slipped 2.4%, while Goldman Sachs (NYSE: GS) fell 2.5% and Bank of America Corp. (NYSE: BAC) fell 3%. Oil Slumps: Oil prices cratered as concerns over Greece fueled a sharp sell-off in energy commodities and energy stocks. WTI August oil futures fell 2.5% to hover just above $58 per barrel. Brent oil fell 2.1% to just a dime below $62 per barrel. A Lone Bright Spot: And now, finally, here is some good news. The National Association of Realtors said that contracts to purchase previously owned homes in the United States hit their highest level since April 2006. The news is a boost to the broader economic outlook of the United States as home buying continues to surge. Many Americans are taking advantage of low interest rates before the Federal Reserve tightens monetary policy later this year. On Tap on Tuesday: Tomorrow, investors will weigh a busy morning of economic data that includes the S&P Case-Shiller Index and Consumer Confidence. Companies reporting earnings tomorrow include ConAgra Foods Inc. (NYSE: CAG), Greenbrier Company Inc. (NYSE: GBX), Star Bulk Carriers Corp. (Nasdaq: SBLK), and UniFirst Corp. (NYSE: UNF). Stocks to Watch No. 1, AGO: Bond insurance companies took the biggest hit today, but it wasn't just Greece causing crisis in their board rooms. Today, Assured Guaranty (NYSE: AGO) dropped more than 13.3%, while rival MBIA Inc. (NYSE: MBI) slumped more than 23.4% after both companies received downgrades on concerns tied to Puerto Rico's debts. Stocks to Watch No. 2, EBAY: Shares of eBay Inc. (Nasdaq: EBAY) slipped more than 2.7% after the company received a downgrade from "Buy" to "Hold" from financial services firm BGC Partners. The news comes on the heels of an announcement that its board of directors approved a corporate spin-off of PayPal Inc. According to the terms of the eBay-PayPal spin-off, the firm will relist on the Nasdaq under the ticker PYPL, and eBay shareholders of record on July 8 will receive one share of PayPal common stock for each eBay share. Stocks to Watch No. 3, TNGA: Shares of Tegna Inc. (Nasdaq: TGNA) jumped more than 5% today after the publishing company was spun off from former parent Gannett Co. (NYSE: GCI). Shares of Gannett dropped more than 5.1% on the day. Stocks to Watch No. 4, XOM: Oil multinationals Exxon Mobil Corp.(NYSE: XOM), BP Plc. (NYSE ADR: BP), and several other industry players announced they have suspended an exploration program in the Beaufort Sea, a territory of the Arctic Ocean. The company said they will not be able to complete production tests before their drilling lease expires in 2020. The news follows a similar decision by Chevron Corp. (NYSE: CVX) in December. Today, shares of BP slipped 2.5%. XOM shares were down 1.2%, while CVX shares fell 1.9%.